This Manasquan Monmouth County NJ Art Gallery & Framing Business was looking to update its entire digital marketing presence, including ( for starters ) its website. 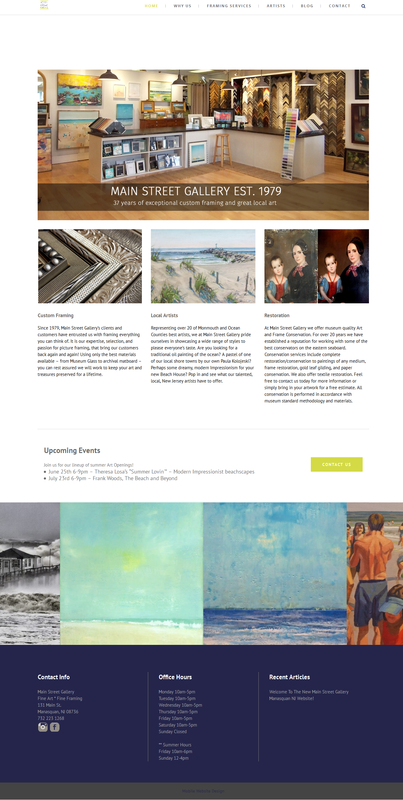 They needed a very particular presentation of their various great NJ artists, with a new mobile responsive WordPress website. We developed a strategy to work around an existing logo design and then carefully project managed customization through a series of mock-ups and then final development on to WordPress. We worked through color palette, background colors, image(s) compression, sizing & presentation, individual & summary projects pages, graphics, fonts, all navigational elements PLUS several custom pages formatting.